After wading through the sea of people we finally located the Holding Tent, which is huge but they were separated into a few sections with the designated area for each category, there were signs in front of each section so we were able to get into the correct one rather quickly. 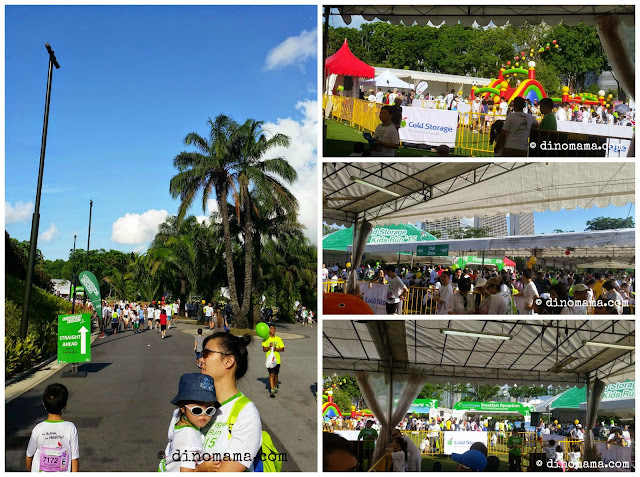 Being a super hot and sunny day, we were relieved that the tent was well ventilated and the volunteers were passing chilled drinks out to all the participants while waiting for our designated flag off time. And in a short while we were shown to the starting line and its Flag Off Time!!!! 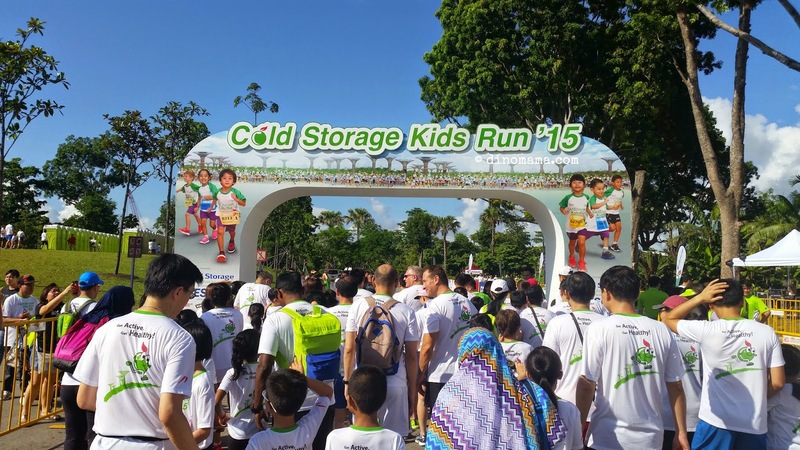 At first I was walking, then I jogged, in seconds I have to try running and zipping through the other participants because DinoBoy ran off alone! Now before the race starts, the Emcee said "Parents please hold on to your child's hand. 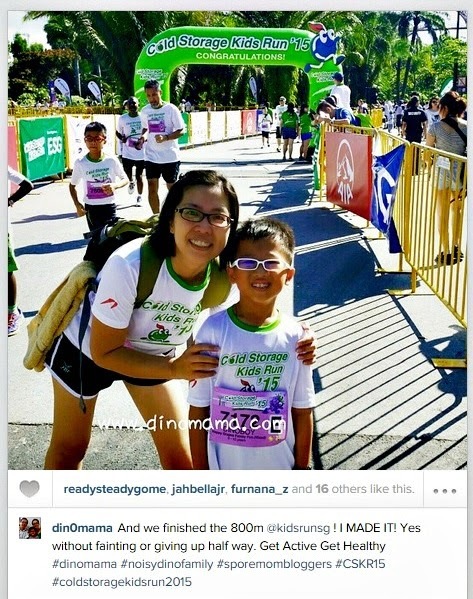 ", next time they should also say "Kids don't let go of your Mummy or Daddy's hand when running." I gave up after few minutes because this little fella was gone like a flash, I couldn't catch up with him, plus Mabel called me at that moment to ask me "Where are you?" and I lost track of him. I was not the least concerned because the fella is street smart plus the last I saw him, he was trying to catch up with his uncle and cousin. So the situation is such, DinoBoy running further ahead of me, I'm jogging and walking in my own pace, thus no photos of us running together BUT I managed to snap this photo of us together at the Finished Line. Yes I made it! Yes! I walk/ran/stroll the 800 meter. Yes! My fats and lungs and muscles all complained to me at the same time all through the 800 meter route. Yes! 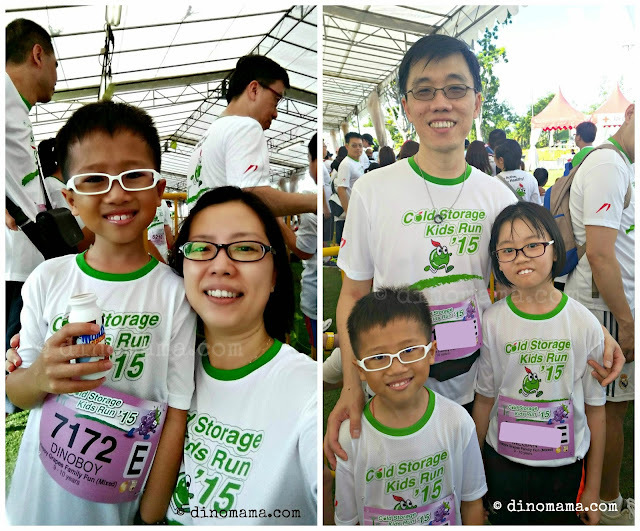 I did not give up (though for a split second at the middle of the race). So proud of myself! 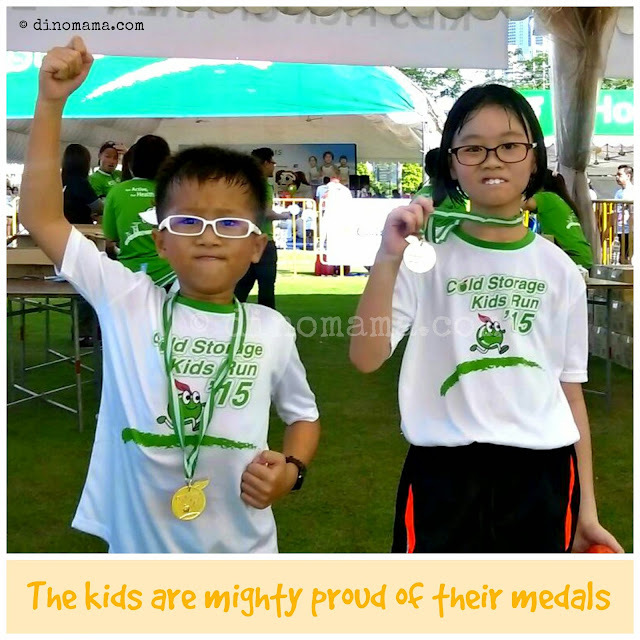 And I am equally proud with DinoBoy too! 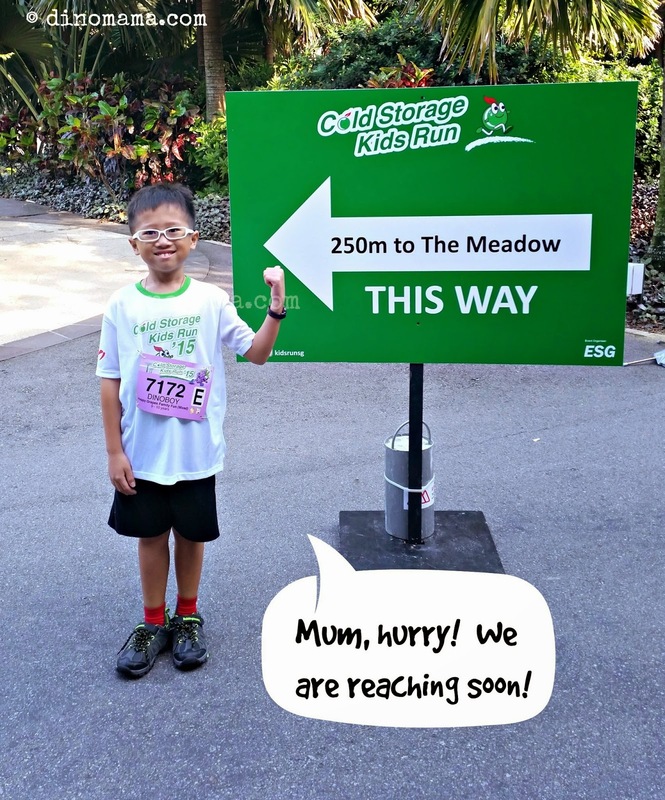 This is also his first 800 meter run and according to my brother he kept on running and jogging, never stop for a while till he finally reached the finish line. 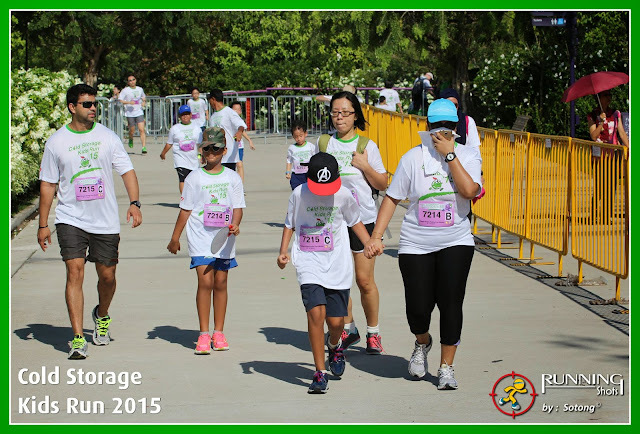 Lucky for the Running Shots who were there to take random photos of the participants, I managed to find 2 photos that have us in it! *whishpers* so you see I never bluff you all, we really take part and ran at the run. Can you see the boy at the background? There was a Sports Carnival Zone too where the kids can try their hands on rock wall climbing, soccer and the Bubble Bump Invasion. However we did not go there because the sun was too hot for our liking, after a long rest we headed home instead. For our fist run we really enjoyed it and I have a rouhg idea what to expect from such run, let's hope they are as well organized as the Cold Storage Kids Run. Will we be joining any more run? Well... 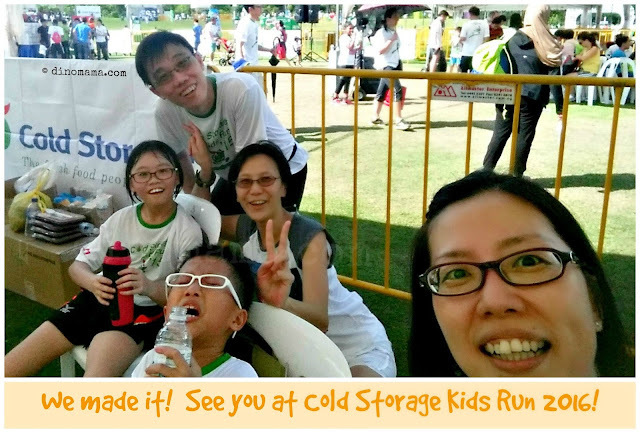 I have not decide yet but we will return to the Cold Storage Kids Run again! 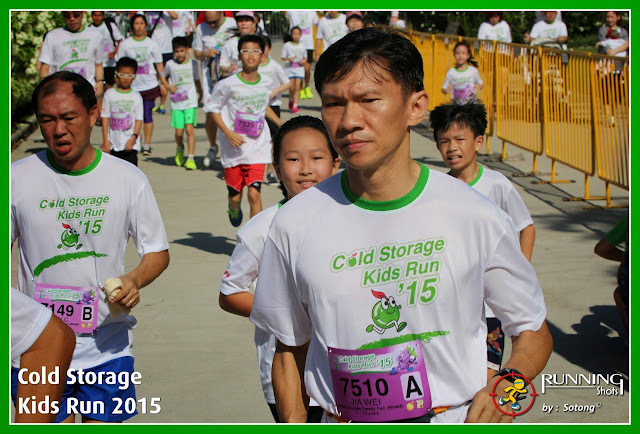 Disclaimer : We were invited by Cold Storage for the Cold Storage Kids Run 2015, all opinions are based on our experience during the event and photos; otherwise credited accordingly, belongs to the DinoFamily.